At least 33 people have been killed and about 100 injured in a spate of car bombings in mainly Shia areas of Iraq, local officials say. They say 17 people died in twin blasts at a market in Baghdad and another 13 in explosions in the town of Shomali, south of the capital. At least two people were killed in a blast in the holy Shia city of Karbala. Sunni insurgents linked to al-Qaeda have been blamed for much of the recent violence across Iraq. No group has so far claimed responsibility for Friday's bombings. Meanwhile, thousands of Sunnis held protest rallies in several cities against the Shia-dominated government of Prime Minister Nouri Maliki, accusing him of monopolising power. The two bombs were set off just after 09:00 local time (06:00 GMT) at the packed bird market in Baghdad's northern Khadimiya district, the officials say. The first bomb exploded at the main entrance, and as panicked crowds tried to flee the area, the second device went off. Later on Friday, a car bomb exploded at the main bus stop in Shomali, killing at least 14 people. The second blast targeted a local market. 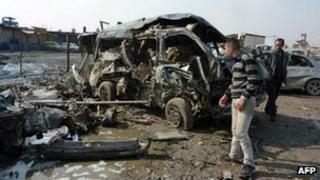 In a separate attack, at least two people were killed in a car bomb blast on the outskirts of Karbala. The bombings are the latest in a series of deadly attacks in Iraqi cities that have left scores of people dead since the beginning of the year.